NEW YORK (CNN) -- A Staten Island Ferry lost power and hit a pier Wednesday at full speed, resulting in one serious injury and nine minor injuries, a Coast Guard spokesman said. The New York Fire Department estimates that 750 to 800 passengers were aboard the Staten Island Ferry. Coast Guard boats were on the scene, the St. George Terminal on the north shore of Staten Island. The Coast Guard spokesman compared the ferry's loss of power as it neared the pier to a car losing its brakes. The hard landing occurred at 7:10 p.m., according to the Coast Guard. The New York Fire Department estimated that 750 to 800 passengers were aboard. The impact did not send any passengers overboard, the spokesman said. Emergency responders were transferring the injured to Staten Island's Richmond University Medical Center. 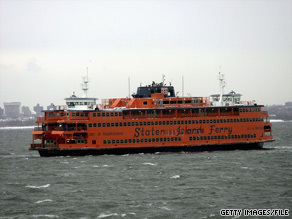 Representatives for the Staten Island Ferry did not respond to calls for comment.